Cooking low carb high fat (LCHF), means for me, to remain interested in this lifestyle, I need to experiment, make a variety of dishes and really enjoy my food to feel satiety & not be bored. This recipe, is one of my favorite, oh my goodness, it is so yummy and more-ish, that I was swiping my finger across my plate to ensure I got every scoop of the gravy/ sauce made from this chicken. My tongue was even tempted! Words can’t explain how more-ish it is! This is definitely my #1 dish so far in LCHF, and will be done a few times over the next few months. Season the chicken with the salt & pepper. Put a large saucepan or frying pan over a medium heat and add the oil. When the oil is hot, add the garlic cloves and fry gently until slightly golden. If you do this too long, your garlic will start popping out of the skins like popcorn! Remove the garlic once done. Then in batches, add the chicken pieces. Fry for a few minutes on each side, so nicely browned and remove from the pan. Pour in the wine, and add the bay leaves shaking the pan to assist the wine in emulsifying with the oil. Add all the chicken back, as well as the garlic (now without the skins). 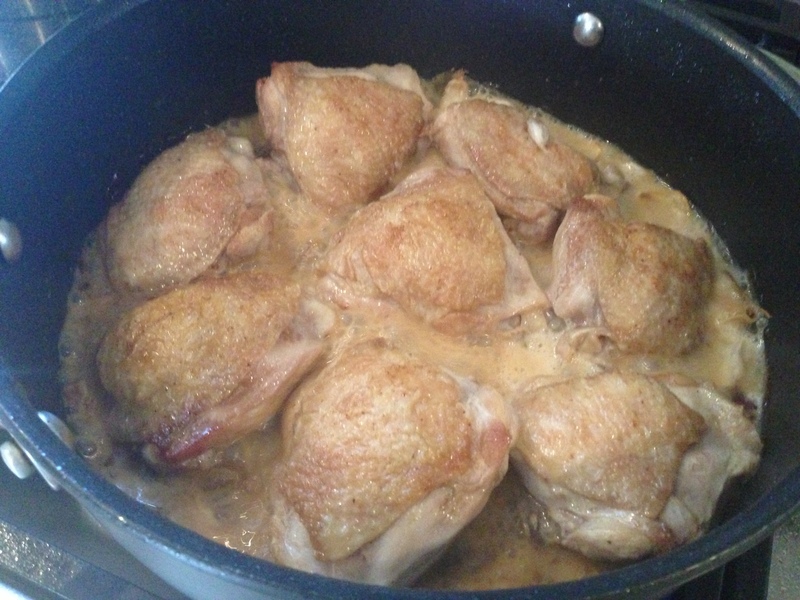 Simmer for a few minutes to evaporate some of the alcohol, whilst turning the chicken pieces in the sauce. Stir in the water. Cover with a lid, and simmer until fully cooked, which is usually another 10-20minutes. If some of the smaller chicken pieces are cooked, remove from the pan and put to the side, put back in a few minutes before all the other pieces are done. Add more water if necessary and if the sauce is getting too thick/ dry. LCHF ideas: Serve with a fresh salad or steamed vegetables. Other ideas: Mash or baked potato will be ideal with this dish. This entry was posted in LCHF recipes and tagged bay leaves, chicken, chicken pieces, coconut oil, garlic, garlic chicken, garlic cloves, ghee, LCHF, low carbohydrate high fat, white wine, white wine & garlic chicken by angelb38. Bookmark the permalink.